Can native advertising help brands overcome 'Banner Blindness'? A doctoral student in Texas diagnosed a new ailment in 1999; a new quirk of the human condition. Jan Benway set up a series of usability experiments at Rice University in Houston to explore how people deciphered information on webpages. She set her test subjects simple tasks: find a book about preparing for the SAT, find information about coaching youth basketball. Navigation to what they were asked to find came in a variety of formats, from plain text links to menus to banners, and the test subjects were timed to see how long it took them to complete the task. Benway's discovery was "banner blindness". Design something visually striking, place it at the top of a webpage, demand users' attention, and there is every chance it will be ignored. Benway's research came just five years after Hotwired magazine sold the first banner ad to AT&T in a move that appeared to signal a new and lucrative revenue stream online for publishers – and a new way to measure the effectiveness of ad spend. While her findings cast doubt over the effectiveness of online display, they in no way slowed its growth. Figures from the Internet Advertising Bureau (IAB) and PwC published in October put online display spending at £738m in the UK in the first half of 2013 – an increase of 23% on the same period last year. However, concerns remain about "banner blindness". Research last month by Dave Chaffey of Smart Insights revealed the click-through rates for different types of display ads in different territories. "Display ads only gain around one click every 1,000 impressions. Shocking! It seems that banner blindness is alive and kicking," Chaffey reported. He suggested that measuring "interactions" – users who expanded an ad, hovered over it for more than one second or viewed it in full screen mode – would show an "interaction rate" of about 2%. Of course, ads have evolved. There's animation. There's interactivity. Echoing Chaffey's point about interactions with ads, there's a broader argument that display contributes to brand awareness whether or not a user clicks. Most importantly, paid search and re-marketing ads speak directly to what people have been looking for online and target user intent. It's easy to see why search ads accounted for about 60% of the £3.04bn total online advertising spend in the first half of this year, according to the IAB and PwC research. But the rise of content marketing poses publishers with a different problem. Brand storytelling often doesn't fit in a box in the margins of a webpage. Smart brands are looking for ways to be useful to customers; to engage them with brand content they want to share. They aren't looking to produce advertorial that masquerades as editorial – the old print trick of using similar fonts and laying out copy like a news story. They are looking to produce content with editorial integrity. Call it native advertising if you must. I see it as brands showing that good stories earn attention. Good stories tell you something you don't already know that's worth knowing. A good story can surprise, delight, shock or frustrate. It can be entertaining or illuminating; sometimes both. It's not just journalists who can do that. 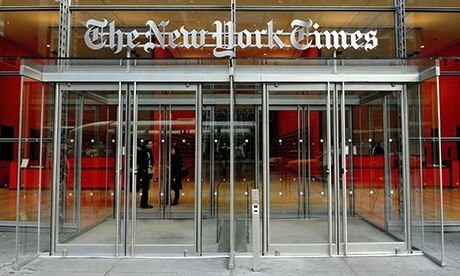 Meredith Kopit Levien, executive vice president advertising for the New York Times, has revealed that a "branded content" advertising unit will form part of the company's website redesign, which is due to go live early next year. "We believe that marketers have stories to tell and they're looking for atomised ways to tell those stories and ways to amplify their messages," Kopit Levien told Ad Age. She's right. Nonetheless, many editors and publishers see it as a worrying development. "The clear delineation between news and advertising is becoming more and more blurred. We have to resist that," Gerard Baker, the editor of the Wall Street Journal, told New York University's journalism school earlier this year. For my part, I sign up to the line often attributed to George Orwell: "Journalism is printing what someone else does not want printed: everything else is public relations." So I'd ask any editor, how much of what your reporters have produced today is something that someone else does not want published? There's always the Media Standard Trust's churnalism tool to help check if there's any doubt about the answer. It's not criticism: just a plea for pragmatism and engagement from editors to find alternative ways to help brands tell their stories. So, 14 years after her PhD thesis, where is Jan Benway now? After spells at Sun Microsystems and Intuit designing tools for software development and small business accounting, she now works at a life sciences software company called Ingenuity Systems making web-based software tools for microbiologists and geneticists. Does she still think her findings about banner blindness hold true? "Yes, I still think there would be the same response in users today, though the breadth of graphic design available to designers today has increased dramatically since the late 90s," Benway said. "There are many more tools available to designers now, to incorporate attention-getting elements. On the other hand, the users themselves have changed. In many ways, they are more savvy, but in other ways less so, since most web users in the 90s were early adopters. "Simply, users are focused on their own goals, and those goals are rarely aligned with the goals of advertisers. They learn quickly where to look and focus their attention on the information that is critical to them."